Learn about the temperament and personality of the Portuguese Water Dog. Discover what he's like to live with, his traits and characteristics and how he generally behaves. And look at lots of Portuguese Water Dog photos. This intensely loyal breed was bred to be a seafaring working dog. He worked on fishing boats, retrieving things from the water, carrying messages between boats, herding fish, and even guarding the catch from seals. He is highly energetic and tireless, and as a family pet, will need lots of activity to keep him happy. He is exceptionally intelligent and takes well to obedience training. Today, the Portuguese Water Dog excels at obedience, agility, flyball, rally, herding, and drafting competitions. And as you might guess, he loves to play in the water. This is a dog who is happiest when he gets rigorous exercise each and every day. If he does not get enough exercise, he will get into mischief. The breed does well with children who know how to behave around dogs, but parents should supervise, as this is a big dog who plays hard. He makes a good watch dog, because he is big, with a loud, deep bark, and is cautious with strangers. He bonds easily with his family and becomes protective. He thrives on and demands human attention and will not do well if left alone for hours at a time. The Portuguese Water Dog is said to possess a unique sense of humor, and so should his humans, as these independent, spirited dogs stay quite active well into their senior years. The Portuguese Water Dog is intelligent and quite easy to train. He learns new commands quickly at an above average rate. 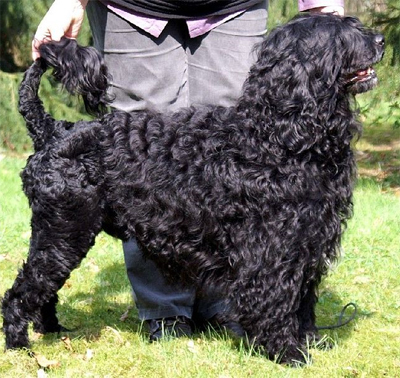 The Portuguese Water Dog sheds practically no hair at all. You'll virtually never find a hair in your home!